It‘s possible to count even 8-9 different textures which have their own characters. Mix of textures in this apartment ineed surprises one: I think that it‘s possible to count even 8-9 different textures which have their own characters. Some interior solutions have literally bewitched me and I really admire the architects, who implemented and designed this home interior. 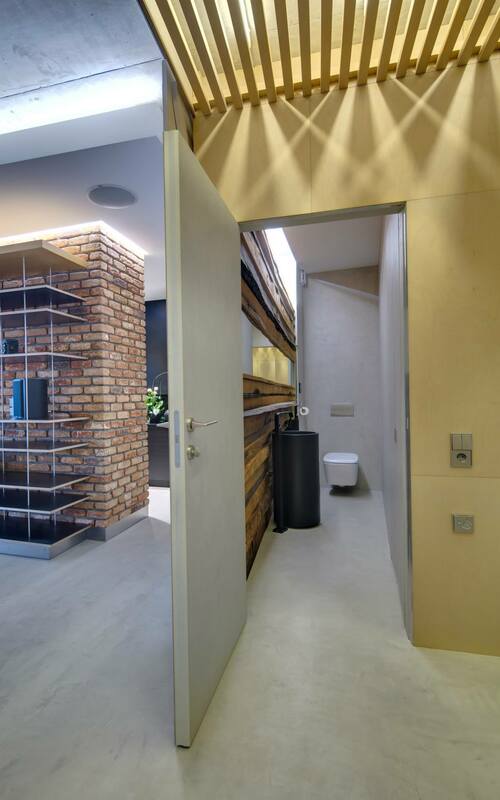 It could be that somebody would consider that a real madness when trying to cram various materials into 120 square meters, but for me everything matches perfectly here. 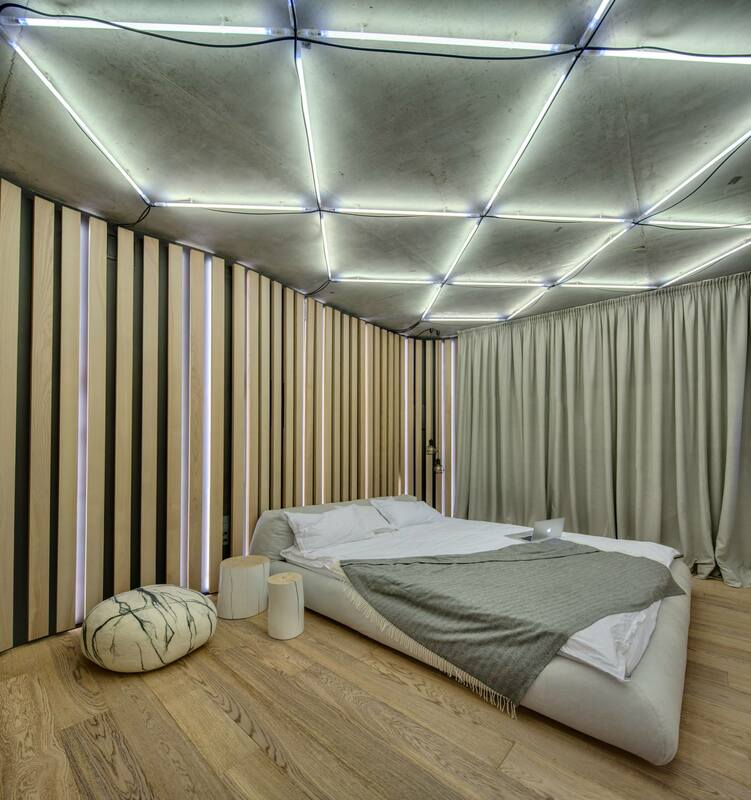 This loft-style flat in Ukraine, Kiev, is non-standard by its planned wall structure. The living room is combined together with the kitchen, however, both of them are very wisely separated even though I would like to have a bit wider kitchen because now the cabinets and doors can be opened only from one side. 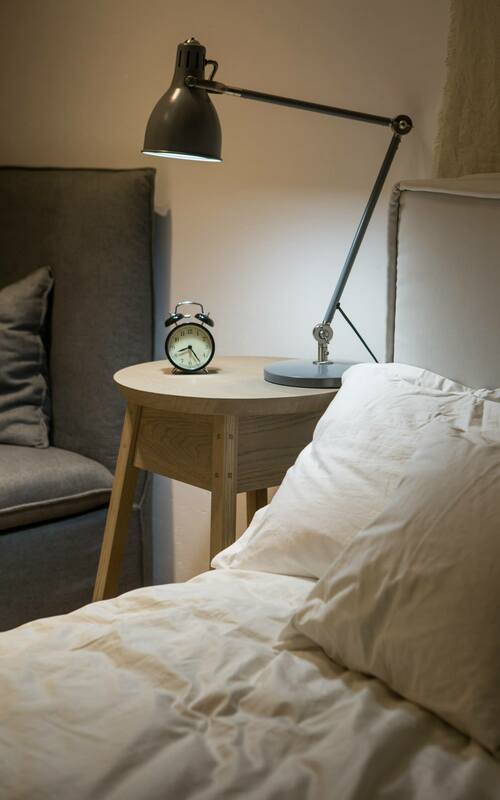 Indeed, that’s visible that the residents of this place spend a lot of time in a living room and a comfortable big sofa and the audio system of high quality are important for them. What more is visible from the plan? 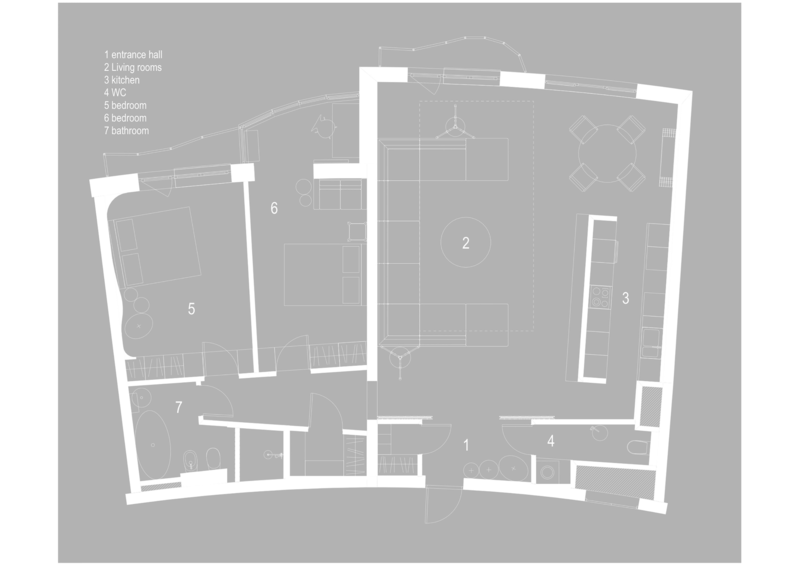 Two bedrooms and two WCs one of which is bigger and more confortable are accommodated. 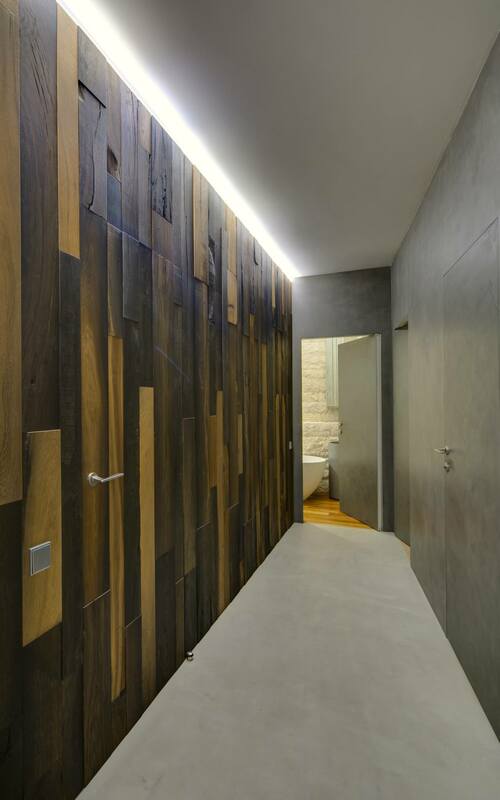 A corridor/entrance hall admires by its original ceiling and illumination solution. Everything else is very laconic, however, in some places soft “stones” are thrown around and they provide some coziness and vitality. As far as we go from the beginning there‘s the view into a WC that we see. The floor in the living room, WC, kitchen and hall are made of micro polished cement which is treated as a single element, differently than the tiles which have a lot of links, clashes and spaces. 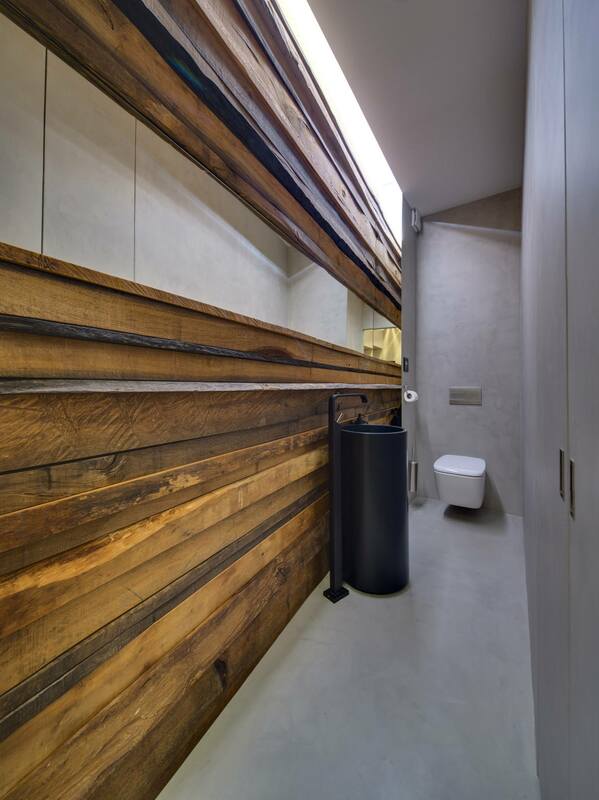 Wooden walls perfectly fit in WC, however, I want to emphasize that a narrow room received the corridor effect due to its horizontal lines alon the long wall. 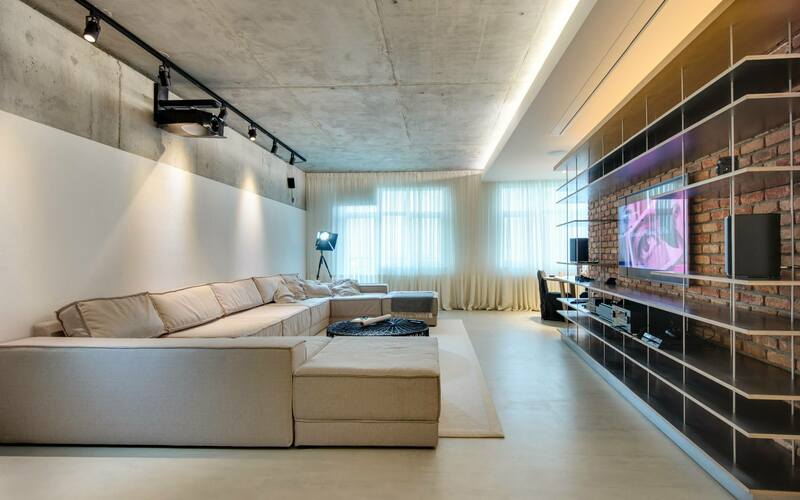 A concrete ceiling are “climbing“ on the walls a bit – super combination. 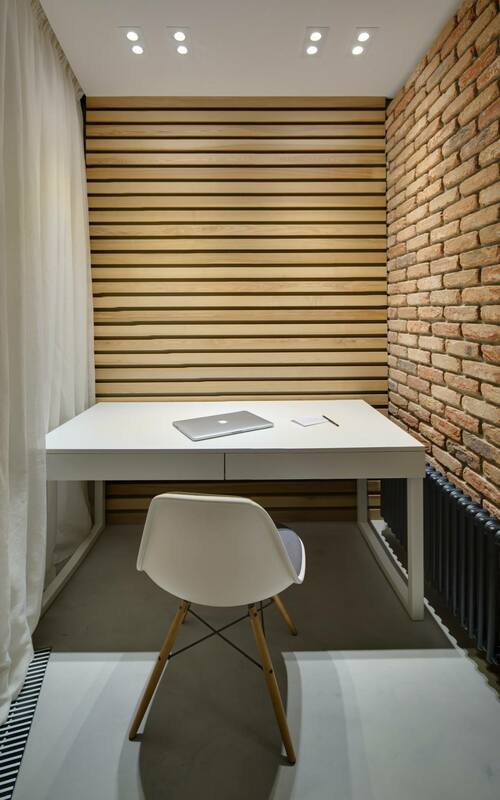 The brick wall gives a lot of coziness here but for me the carpet of a brigther plain colour , e.g. spotty or of a bright colour, would fit better here. Well, and the sofa is indeed of a king size! 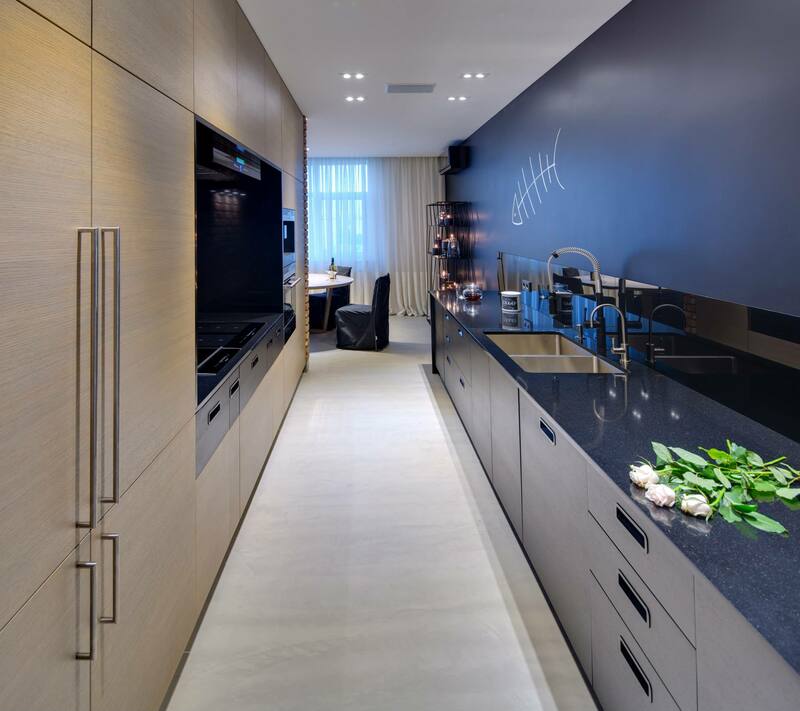 A kitchen is also very laconic, but we therefore have the handles there – I expected that the kitchen furniture will be completely without the handles. That fish-bone drawing and the roses laid down on a tabletop look very symbolic... 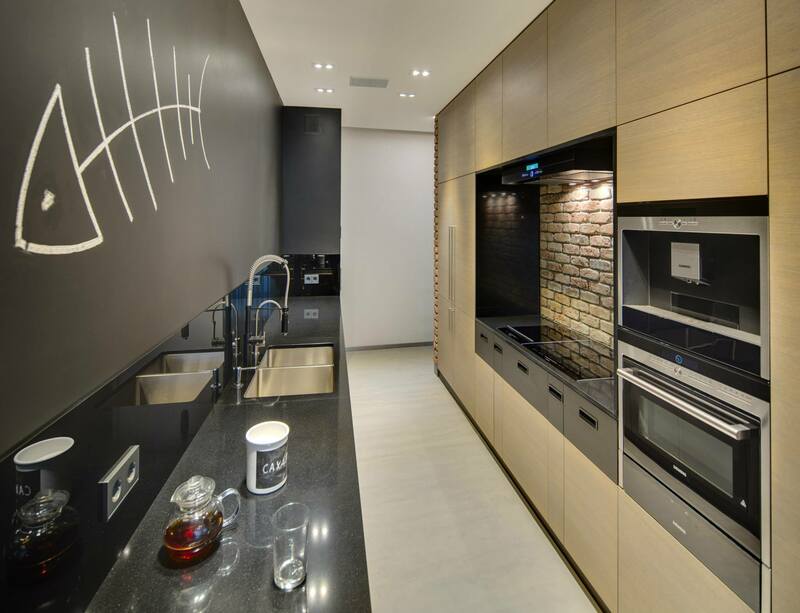 I adore the bricks in the kitchen but I'm wondering if it's practical. Maybe you have such wall without glass? Do you have any comments about it? And here’s indeed the bedroom! Doesn’t it look like the ceiling is soft? 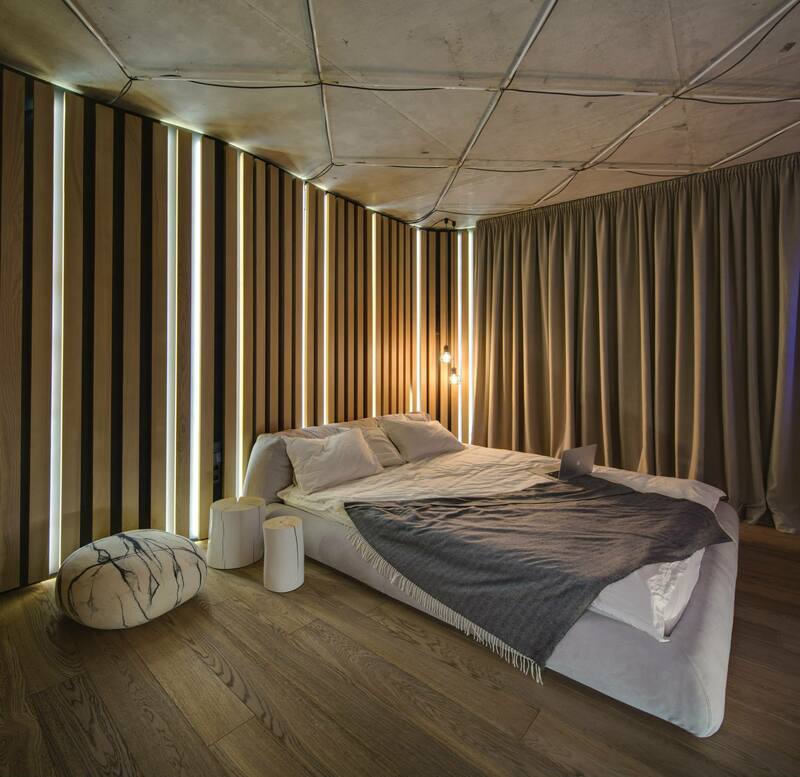 Indeed I haven’t seen such a solution anywhere, I’m under spell, I only don’t know if me myself would like to have such a bedroom. And this soft lighting which spreads from the following tables to the walls is fabulous and looks like the second curtain! The second bedroom is a bit earthier if it’s possible to say so. 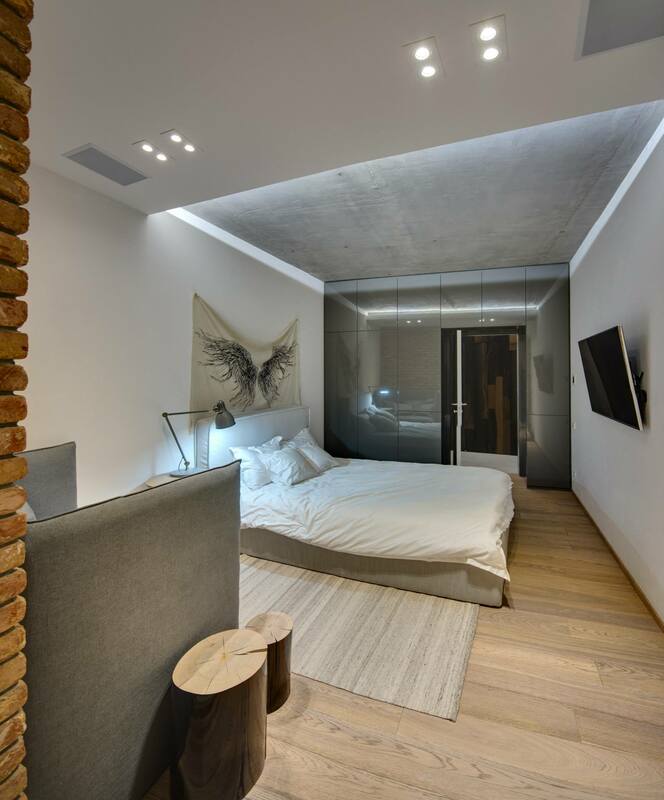 The concrete ceiling which are illuminated nicely, the wardrobe with a mirror surface along the whole wall look very contemporarily. The mini work zone is equipped in the same room behind the wall. Well, indeed, very mini and indeed sterile and tidy. I'm writing a plus for a black heater! We come closer to a second WC where again we see hints of wood (maybe even not hints but all the areas). The doors to the closet are incorporated into a wooden wall, only somehow now the vertical tapes are used. 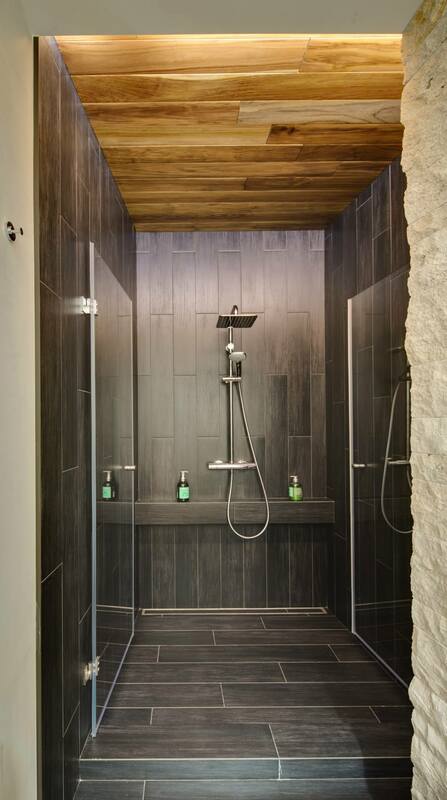 Oiled solid wood boards are used in a shower and in a bathroom floor and ceiling. And here’s my favorite place after the bedroom. I like natural wood usage veeeeeeery much. 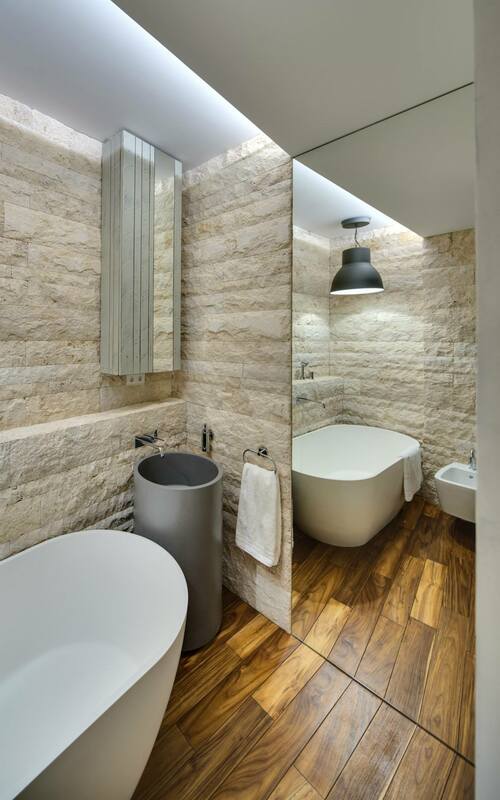 This texture and lighting revealing all nuances of a stone surface, wooden floor and a huge mirror (I even don’t talk about a sanitary ware) indisposes very relaxingly! Because of the impression which this interior leaves I’m writing a strong 10 without going deeper to some of the nuances. 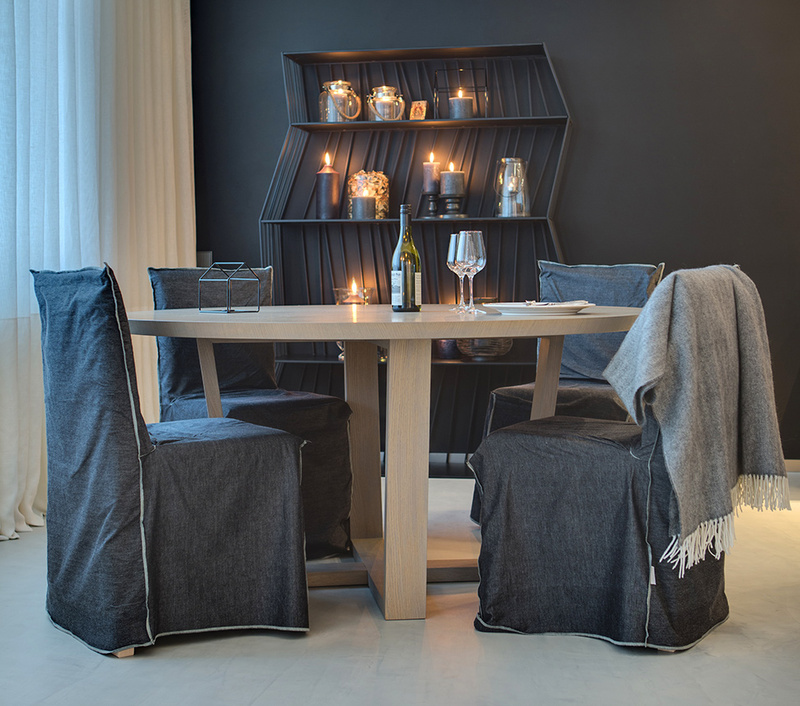 Older post Fashion trends = interior trends?